Yesterday we celebrated Seb's sixth birthday with a group of his close friends at our local Pizza Express restaurant. I'm going to write a few different posts around Seb's birthday but I thought I'd review our party experience independently for those who're maybe stuck for ideas, or want to know more about what's included in Pizza Express's party package before booking. I've no doubt that the party format differs subtly depending on which restaurant you book with. Our local Pizza Express overlooks the royal harbour at Ramsgate, and has a separate private dining space which can seat up to fourteen children for parties. Having the extra dining room meant that I didn't feel quite as bad for those people who'd come into the restaurant for a quiet, mid week treat! I believe the restaurant used to hold the parties in the main dining area but this, unsurprisingly, upset other customers! Booking Seb's party at Pizza Express was super easy - we went for the maximum number of guests, and booked over the phone. We didn't have to pay a deposit or fill anything out - the manager just took a few details (number of children and approximate age range) and that was that - it was in their diary. I then arranged with the parents of the children attending to book a separate table in the main restaurant for those who didn't want to drop off their children and leave. We ended up with about eighteen parents and younger siblings for food and drinks on our table and the restaurant were really accommodating - even when everyone needed to pay for their individual orders. My food, as always, was lovely - being vegan, Pizza Express is one of my go-to chain restaurants because I know like the back of my hand which of their dishes are suitable for vegans (or which substitutes to make) - as yet, whilst the service at Ramsgate can be monumentally slow, I've never had a bad meal. Unsurprisingly, service was characteristically slow on our table but I'd forgive that given that they were trying to juggle a party of fourteen 5-6 year olds, plus our table of eighteen additional diners, and other tables in the restaurant. So back to the party. The lady who ran Seb's party was fantastic. It always amuses me how well children behave for someone who isn't their everyday care giver. 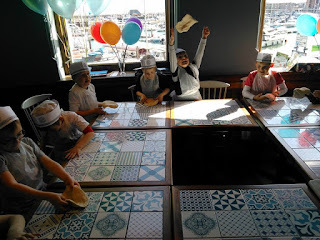 At one point I stuck my head in the door of the party room whilst she was teaching them about the ingredients in pizza dough - and they were all sat, silently enthralled. The party began with some seated party games which I guess got them in the mood and probably gave the party leader the opportunity to get to know who was who in the group. After a short while, pizza dough was brought out from the kitchen and the children were taught how to stretch it to make pizza. It was at this point that they were taught about the ingredients that go into pizza dough and where these are sourced from. Once the dough was ready, the children had the opportunity to tour "behind the scenes" in the restaurant, visiting the kitchens and freezers, before returning to the party room to top their pizzas with their own choices from a range of toppings. Seb, unsurprisingly, opted for ham and cheese because he is painfully predictable and totally vegetable-phobic! The pizzas went in to the oven and the children were served a starter of dough balls with garlic butter dip and a salad. Then, their finished pizzas arrived fresh from the oven, and they got to eat their creations. I thought this would be a complete mess, and imagined some of the pizzas being inedible but actually, the whole group had done really well and everyone had a decent looking pizza to eat. Takeaway boxes were provided for anyone to take home any pizza that they didn't manage to finish, but they all seemed to enjoy what they'd made as there wasn't a huge amount of pizza going home! Seb has a ridiculously wobbly tooth, right at the front, at the moment so I think that kind of hindered his pizza munching abilities! He did well though. 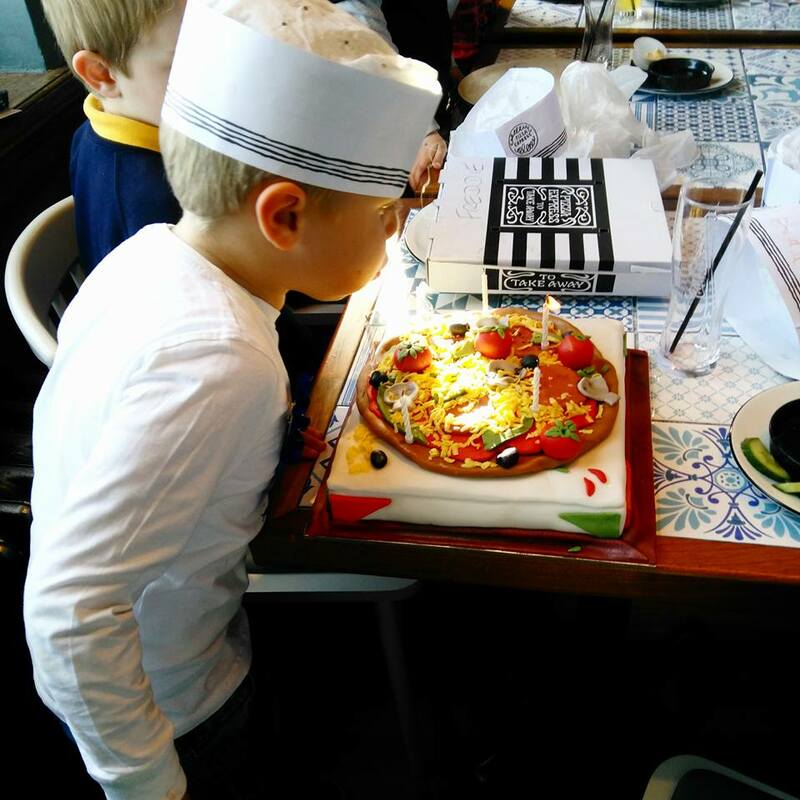 We provided our own birthday cake (birthday cake isn't something Pizza Express offer as part of their package) which was fine as I have a friend with a cake making business who made us an incredible pizza birthday cake. I might even review the cake separately because it was the bombdidillyom. So after the children had finished eating their pizzas we lit the candles and celebrating with some traditional Happy Birthday singing, before the children were served ice cream sundaes for pudding. The children had also had unlimited fruit squash to drink throughout the party which was included in the package. 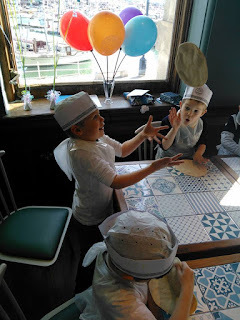 I'm totally satisfied that we got really good value for money for under £170; fourteen children were fed, and had a really great time - the laughter throughout and huge smiles on their faces said it all, and Seb had a wonderful birthday which is, of course, the main thing. The restaurant were really accommodating and patient and I really can't fault them on the party that they delivered. I think Seb and his friends were probably the perfect age for the party, I don't think I'd have wanted to do it with much younger children, as it does involve them being pretty engaged and independent of their parents for a couple of hours, but 5-6 and upwards get loads from the experience and it was totally stress free for us parents too! This is one I'm going to stamp with my approval and recommend to other parents with school age kids. 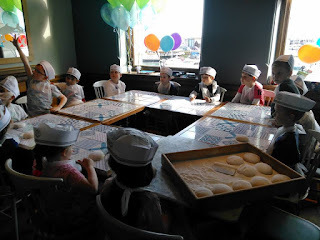 Pizza making parties are available at most Pizza Express restaurants. 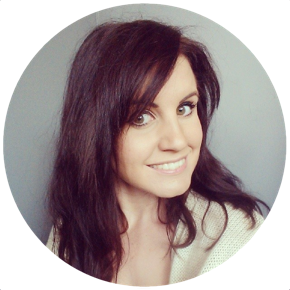 I am the lady that ran your child's birthday party - thank you so much for your review it was great to read and reflect on Sebs birthday and Im really glad you all enjoyed the day.